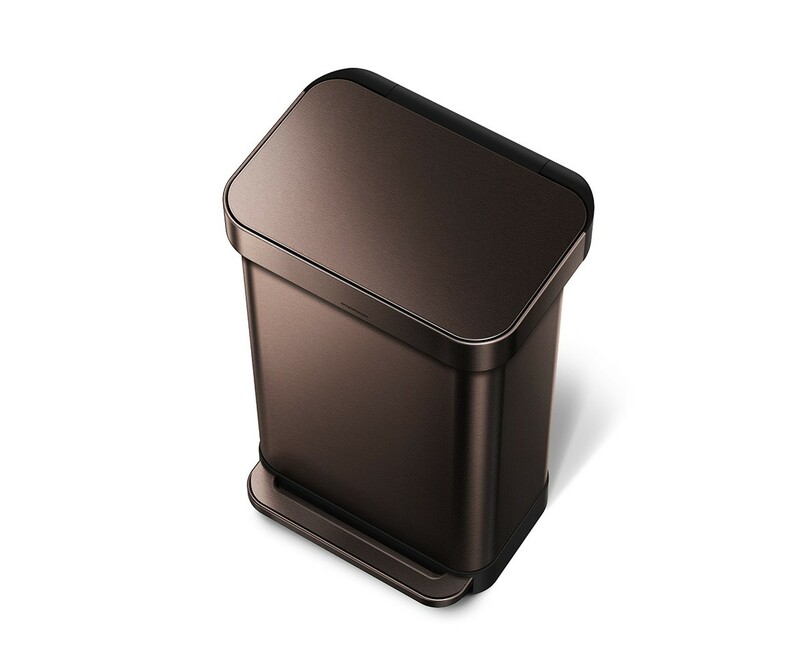 Our new dark bronze steel rectangular step can features an innovative 'liner pocket' that stores and dispenses liners from inside the can for a faster liner change. The liner rim grips the liner and keeps it hidden. And with no inner bucket, there's more space for trash. Strong wide steel pedal is designed to last, and our patented lid shox technology ensures a smooth, silent close every time. Code M liner refill packs store perfectly in this can's liner pocket. By eliminating the inner bucket, we managed to get the same amount of capaicty into a smaller, more space-efficient can. 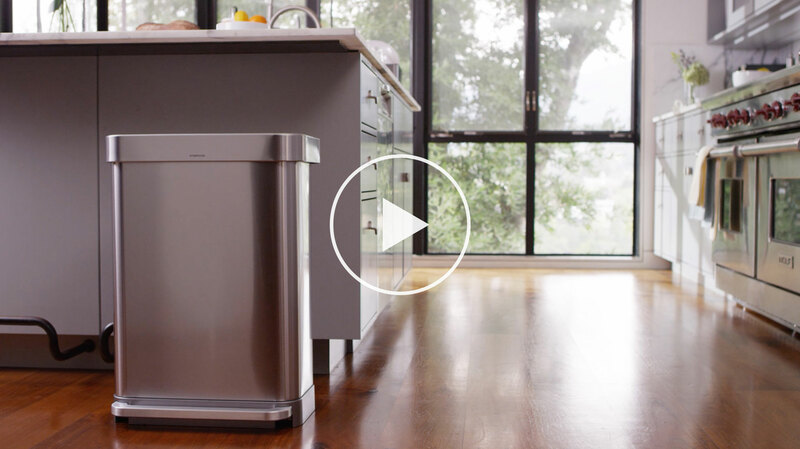 Add an optional blue plastic bucket for easy disposal of recyclables. Code M liners are designed to fit this can perfectly and are extra strong to prevent leaks and tears. Great colour match for my new kitchen and good bin size. My only concern is that the foot pedal is already scratching a tiny bit, but hopefully it won't progress any more. I gave my stainless 45 Litre can to my friend after purchasing this new Dark Bronze Steel. This colour is awesome and matches the lower half of Mahogany kitchen cabinets. The colour deters fingerprints as does the stainless, in fact it is the same can. Please make more products in this colour and my friend will be very happy to receive my pay it forward cans, ha ha. I had the same 45 Litre can in stainless and gave it to my friend after I saw this new Colour. I purchased it to blend with my mahogany Colour bottom kitchen cabinets. The function is exactly the same as the stainless. The look however is dramatically different in a more perfect form overall for my kitchen. I love it and the material used is ultra fingerprint deterrent, just perfect. Now Simple Human, bring out more products in this gorgeous Colour please. My friends will be very happy to receive my stainless. I had the same 45 Litre can in stainless and gave it to my friend after I saw this new colour. I purchased it to blend with my mahogany colour bottom kitchen cabinets. The function is exactly the same as the stainless. The look however is dramatically different in a more perfect form overall for my kitchen. I love it and the material used is ultra fingerprint deterrent, just perfect. Now Simple Human, bring out more products in this gorgeous colour please. My friends will be very happy to receive my stainless pay it forward products! 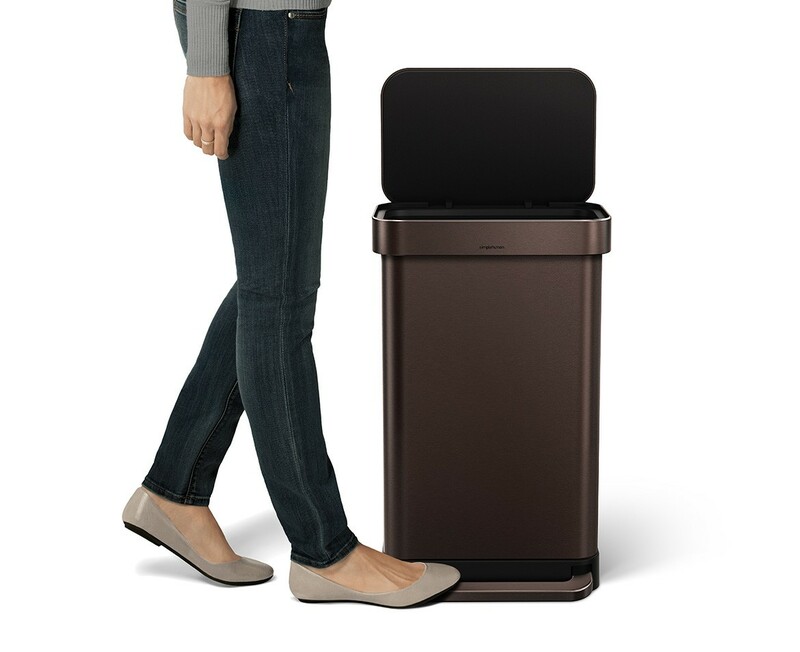 The quality on the trash can is very good. Heavy gauge metal and very good operation. The internal trash bag storage is brilliant!. I would recommend it to everyone. Love this new bronze color -- matches my kitchen perfectly. Wish I had bought this sooner - functions perfectly and keeps in smells.